editor's note: this review originally appeared in the Horror Fest VIII coverage. Rosemary’s Baby may be based on the novel by Ira Levin (Son of Rosemary) and be produced by William Castle (The Tingler) directed by Roman Polanski (I can only imagine what’s going to happen now that I’ve mentioned his name again on this blog), but it’s really the story of a book. And not just any book, because while Rosemary Woodhouse (Mia Farrow) has a lot of books, including the conspicuously placed copy of Yes, I Can: The Story of Sammy Davis Jr.*, the most important one appears about an hour into the film. Of course, I speak of All of Them Witches. Oh sure, the title is an anagram (although not the one Rosemary figures out – for the record, you can make “Hell a Cometh Swift from the title), but for whatever reason, it became the running joke of the rest of the movie. There was a lengthy discussion about follow-up books like Some More of Them Witches, The Rest of Them Witches, That Should Cover Every Last One of Them Witches This Time, and the legally obligated retraction book Not All of Them Was Witches After All, and many a chuckle was had. 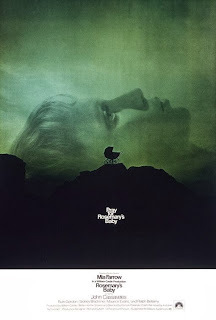 I realize that it’s probably disrespectful to Rosemary’s Baby to talk about it this way when I’ve never properly written about the film here before, but sometimes when you’ve seen a movie enough times and you’re with a crowd of people who have as well, instead of focusing on the actual story you begin to fixate on silly details or make jokes. While I often try to give a film its proper perspective on the Blogorium, much of what constitutes a Horror Fest recap is trying to convey the atmosphere surrounding the screening as well. There were many jokes and references to Cassavetes films (as actor and as director), to Planet of the Apes, Harold and Maude, Midnight Run, The Wolf Man, and to Frank Sinatra, Robert Evans, William Castle, and any number of other ridiculous observations, like what was playing at Radio City Music Hall with Fred MacMurray (our theory – Walt Disney’s The Shaggy Dog: The Musical, or Son of Flubber: The Musical). All joking aside (and it’s really the big point at the fest where the audience participation took over, which the Cap’n fully endorses as long as you can still enjoy the movie), Rosemary’s Baby is a great horror movie. It’s so well constructed and so limited to one character’s perspective that even though you know what’s happening to Rosemary and you desperately want her to get away from the Castevets and the conspiracy in The Bramford, you understand why she’s confused and can’t leave. The world is set against poor Rosemary from the outset, in arguably more insidious ways than even Suzy Bannion faces in Suspiria (it turns out witches, Satan, and issues with pregnancy emerged as the consistent themes this Horror Fest). Her husband is distant and verbally abusive, especially after he gets close with Roman and Minnie Castevet (Ruth Gordon and Sidney Blackmer), her doctor recommends doing nothing when she feels pain during pregnancy, and then her old doctor (Charles Grodin), hands her over to the enemy when she comes to him for help. Her only real ally in the film, Hutch (Maurice Evans), is the victim of witchcraft – as is Guy’s original agent – and the first friend she makes in The Bramford plunges to her death not long after they meet. All the while, Polanski keeps us tightly locked in on Rosemary (although not quite as uncomfortably framed as Catherine Deneuve in Repulsion) as we slowly move towards June of 1966, when her baby is due. I shouldn’t need to spell that out for you, and it’s not as blatantly stated in the film, but if you do the math from when conception happened to when the baby should be due, it only makes sense. The use of dream sequences and somewhat ambiguous dream logic (another recurring motif this fest) helps disorient the audience early in the film, so that even forty five years later, it’s not abundantly clear what Rosemary is imagining and what we’re actually seeing when plans are set in motion. The ending still gets me, despite the presence of one of the worst Asian stereotypes since Mickey Rooney’s unfortunate appearance in Breakfast at Tiffany’s. “What have you done to his eyes, you maniacs!” and, eventually, “You’re rocking him too hard.” It’s unsettling, but inevitable. If we jest during Rosemary’s Baby, it’s only because we like it so. Also, All of Them Witches would want it that way. Hail Satan! * Now, it’s entirely up to you whether Yes, I Can is there because of the Rat Pack connection or just as another subtle hint about the Satanism to come. In the interest of full disclosure, we leaned towards the former.